The output of the error amplifier is integrated over each clock cycle to generate a variable-slope ramp. 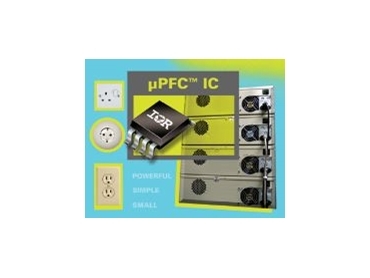 INTERNATIONAL Rectifier has released the µPFC IR1150 controller IC. It uses a one-cycle control, integrator with reset technique to deliver the performance of continuous conduction mode (CCM) PFC with the simplicity and low component count of discontinuous current mode (DCM). OCC does not have the traditional analogue multiplier, ac line sensing or fixed oscillator ramp. In OCC the output of the error amplifier is integrated over each clock cycle to generate a variable-slope ramp. This variable ramp is compared with the error voltage and subtracted from the current sense signal to generate the PWM gate drive. The IR1150 responds to changes in output voltage in one cycle of the internal clock, giving excellent response. Applications over 200W need CCM PFC to have high efficiency and small system sizes but traditional CCM multiplier-based solutions are complex, require many design stages and have a high component count. This makes them very expensive. In a typical 1kW SMPS, the OCC solution has 40% fewer resistors and capacitors, removes a current transformer and has a 50% smaller PCB area for the PFC control section. In addition, the IR1150 has a dedicated over voltage protection (OVP) pin to give greater protection for high power systems. Applications below 250W traditionally use DCM systems for simplicity and low system cost. As system power increases to 100W and above DCM systems are large due to high peak currents and EMI filter requirements. OCC operates in CCM mode with reduced peak currents and a 43% reduction in EMI filter needs. This translates into a 16% reduction in PCB and an increase in power density of 10% for a typical 120W laptop adaptor. The IR1150 includes features such as enable, micro-power start-up and sleep mode for compliance with energy efficiency standards such as 1W Standby, Blue Angel and Energy Star. IR's OCC method meets to PFC (THD) legislation such as IEC 1000-3-2 in Europe, JIS C 61000-3-2 in Japan and the China Compulsory Certificate (CCC) for products using more than 75W. PFC is not yet a requirement in the US but specifications are being prepared by the IEEE. PFC solutions using the IR1150 OCC IC allow designers to create one design with universal ac input for worldwide use. This streamlines manufacturing, inventory and logistics. The system also eliminates ac-line harmonics, reducing the rms current and allowing higher power motors or pumps to be used without tripping domestic circuit breakers.